Pang, Alex Soojung-Kim, Rest: Why You Get More Done When You Work Less (Basic Books, 2016 ). Newport, Cal, Deep Work: Rules for Focused Success in a Distracted World (Grand Central Publishing, 2016). There is a paradox at the heart of Alex Soojung-Kim Pang’s Rest: Why You Get More Done When You Work Less. Pang offers the book as a needed corrective to the cultural narrative that more work makes us valuable to our employers and wealthier, more secure and, more satisfied with our work. The narrative also implies that being more valuable in the marketplace makes us better people. This cultural assumption is rooted in the “Protestant Work Ethic” first articulated by Max Weber in his The Protestant Ethic and the Spirit of Capitalism (1905) in which a person’s moral fitness is directly tied to and reflected in the quality and amount of the work he or she does. Against this background, Pang’s book makes strong claims that rest is as needed, as important, and as valuable as work. It seeks to rehabilitate leisure from an afterthought we fit into unproductive hours to the thing which enables us to work more productively and to lead a more fulfilling life. However, the main shortcoming with Pang’s conception of rest is that, in it, even relaxation serves our work performance. In some sense, everything becomes work. Rest has no intrinsic value, rather it is a way to give our brains a chance to recharge and to make connections that we might not make otherwise. Pang marshals an impressive amount of social science, neurological, and psychological evidence to prove his point. However, he does not seriously grapple with the proper purpose of rest. He asserts that rest allows us to perform optimally in our work and implies that doing so is the measure of a life well lived. He urges those who wish to be counted among those who really matter in the economy and society to rest so that they can be a better, more productive worker. In addition to the scientific evidence Pang uses to prove the benefits of rest, he also makes ample use of the exemplar, recounting the resting habits of people such as Charles Darwin, Bill Gates, Charles Dickens, Anthony Trollope, Scott Adams, Maya Angelou, Paul Cézanne, Stephen King, Steve Jobs, Lin-Manuel Miranda, as well as various CEOs, software magnates, and business people. To Pang, these are the modern-day saints, whose virtuous resting is good because it allows them to become part of the class of productive “creatives” that he valorizes. Another weakness of the book is that the rest it describes is almost always solitary. Resting is done by oneself to improve one’s own creativity and productivity. His examples of restful activities include rock climbing, mountaineering, walking, tinkering alone in the garage on a long-term project, taking a solitary week in the woods to think big thoughts, or creating new languages and fantasy worlds while sitting alone in your study. Rest is not found in meaningful personal friendships or family relationships. Additionally, Pang does not examine the role of rest for people who are not highly productive creative types. How a stay-at-home mother, a doctor on the night shift, a factory worker engaged in repetitive tasks, or a mid-level manager at a big-box store might incorporate some of Pang’s suggestions is not addressed. If rest is such a positive force, it would seem important to consider how someone who is not in control of how he or she spends time might incorporate the ideas put forward. Rest is confused about what the purpose of rest itself actually is. It cannot decide whether rest is a good in itself or whether it is a means to professional advancement and fulfillment. Pang concludes his study with the assertion that “[Rest] creates a life that’s rewarding while it’s lived, a life that has purpose and pleasure, work and reward, in equal measure. And that life feels complete and well-spent at the end” (246). While in this summation of his own work, Pang implies that rest should not be seen in a utilitarian way, the bulk of his own work argues the opposite. Cal Newport’s Deep Work: Rules for Focused Success in a Distracted World shares Pang’s bias toward creative and productive “knowledge workers” and many of his assumptions about workers’ control of their own time. Like Pang, he uses data from neurobiology and psychology to support his assertions. Newport’s work, however, is more prescriptive, offering “rules” to enable knowledge workers to avoid shallow work and maximize deep work. Newport’s schema divides work into two categories. He defines deep work as “professional activities performed in a distraction-free concentration that push your cognitive capabilities to their limit. These efforts create new value, improve your skill, and are hard to replicate.” For Newport, something of value is a new idea, a new product, new knowledge. Knowledge workers performing deeply, find meaning as they perfect skills that are difficult to master. He likens them to highly skilled craftspeople practicing their art. In contrast, shallow work is made up of “non-cognitively demanding, logistical-style tasks, often performed while distracted. These efforts tend to not create much new value in the world and are easy to replicate.” Newport acknowledges that there are some workers and managers who prefer this kind of work. Emails answered, meetings attended, and memos written are an easy measure of productivity and provide tangible proof that the worker is earning his or her wage. It is precisely Newport’s assumptions about “value” that make his analysis insufficient. He does not seem to believe that there can be value in tasks that are inherently shallow. Newport does not seem to believe that there can be value in jobs that are inherently shallow. Therefore, he does not address how workers in these kinds of jobs can find meaning in their work. This group includes the vast majority of workers in the economy, such as receptionists, custodians, waiters, salespeople, bus drivers, laborers, etc. Newport presumes that workers can control their own schedules and tasks in order to work more deeply. These workers—the “inherently shallow ones”—of course, do not have this freedom. A discussion of how these workers might find depth and meaning in their work would have been welcome. There are other gaps in Newport’s analysis. For example, when he asserts the value of deep work in the current economy, he says that “three groups will have a particular advantage: those who can work well and creatively with intelligent machines, those who are the best at what they do, and those with access to capital” (28). He does not consider the implications of this state of affairs for the majority of workers who do not fit into any of these three narrow categories. Instead, he glosses over what will likely be very negative effects of this Great Restructuring to urge his readers to ensure they have a seat on the deep work lifeboat. After this high-level discussion of deep work, Newport turns to his prescription for how to achieve it in one’s professional life. He offers four “rules” to ensure that one can maximize the time spent doing deep work. He recommends that we decide that it is worth it to work deeply and then adopt rituals, habits, and structures that support that decision. He discusses the value of boredom and how our habitual distraction reduces our capacity for deep work. Since the internet is a major cause of distraction, according to Newport, he offers several ways in which we can restrain our Internet habit. Newport also recommends finding ways to work more intensively in shorter periods of time, using meditation techniques to focus our minds, and practicing various techniques to improve our memories. Newport also strongly recommends eliminating social media from our work and personal lives so that we can focus on more substantial uses of our time. Finally, Newport recommends that we quantify how much of our time is spent on shallow work by rating the depth or shallowness of all our tasks and then scheduling every minute of our day into blocks of deep and shallow work. He also has specific suggestions for taming perhaps the most difficult shallow work task, email. Newport closes his book by saying that “the deep life, of course, is not for everybody…. For many, there’s a comfort in the artificial busyness of rapid e-mail messaging and social media posturing,” but that, for the “focused few,” “depth generates a life rich with productivity and meaning” (263). Like Pang, here Newport reveals his biases and negative assumptions about people who are not part of the knowledge worker elite. Pang’s “creatives” and Newport’s “knowledge workers” are essentially the same group of driven and successful high achievers who populate Ivy League campuses and management suites throughout the nation. Both Rest and Deep Work are written for this cohort, or for those who aspire to it. 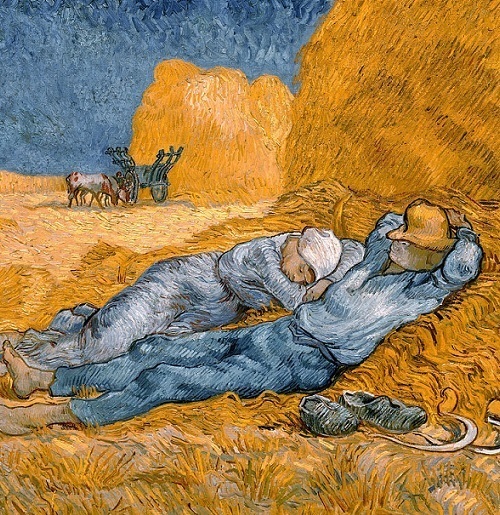 While it is certainly necessary and valuable to reassert the value of rest and leisure and to rescue work from the never-ending and growing stream of administrivia, neither of these works rises above the assumption that the measure of a person’s worth is his productivity, particularly in generating highly creative, deep work. This seems to me to be an altogether utilitarian view of the role of the human person and what work can mean in her life. As St. John Paul II said in his 1994 Letter to Families, utilitarianism is “a civilization of production and of use, a civilization of ‘things’ and not of ‘persons,’ a civilization in which persons are used in the same way that things are used” (Gratissimam Sane, 13). Both Pang and Newport measure the value of workers in terms of their productivity and contribution of work that they consider truly important and meaningful. They encourage their readers to look at themselves primarily through the lens of their productivity, and thus illustrate the problem described by St. John Paul II. Colleen Zarzecki is a full time stay-at-home mother and part-time writer for Lumen Catechetical Consultants, Inc., in Silver Spring, Maryland.